Drawing on interviews with 90 young people who have become Witches, we explore the visual media's influence on identity formation and maintenance. Witchcraft is a late modern religion that is highly individualistic and many young people report they have become a Witch without any interaction with other Witches. 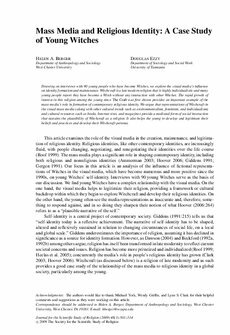 The rapid growth of interest in this religion among the young since The Craft was first shown provides an important example of the mass media's role in formation of contemporary religious identity. We argue that representations of Witchcraft in the visual mass media (along with other cultural trends such as environmentalism, feminism, and individualism) and cultural resources such as books, Internet sites, and magazines provide a mediated form of social interaction that sustains the plausibility of Witchcraft as a religion. It also helps the young to develop and legitimate their beliefs and practices and develop their Witchcraft persona.